Not to be confused with Hominidae, Homininae, Hominina, Hominy, or Homo. The Hominini, or hominins, form a taxonomic tribe of the subfamily Homininae ("hominines"). Hominini includes the genus Homo (humans), but excludes the genus Gorilla (gorillas). As of 2019, there is no consensus on whether it should include the genus Pan (chimpanzees and bonobos), the question being closely tied to the complex speciation process connecting humans and chimpanzees and the development of bipedalism in proto-humans. The tribe was originally introduced by John Edward Gray (1824), long before any details on the speciation of Pan and Homo were known. Gray's tribe Hominini by definition includes both Pan and Homo. This definition is still adhered to in the proposal by Mann and Weiss (1996), which divides Hominini into three subtribes, Panina (containing Pan), Hominina ("homininans", containing Homo "humans"), and Australopithecina (containing several extinct "australopithecine" genera). Alternatively, Hominini is taken to exclude Pan. In this case, Panini ("panins", Delson 1977) may be used to refer to the tribe containing Pan as its only genus. Minority dissenting nomenclatures include Gorilla in Hominini and Pan in Homo (Goodman et al. 1998), or both Pan and Gorilla in Homo (Watson et al. 2001). By convention, the adjectival term "hominin" (or nominalized "hominins") refers to the tribe Hominini, while the members of the Hominina subtribe (and thus all archaic human species) are referred to as "homininan" ("homininans"). This follows the proposal by Mann and Weiss (1996), which presents tribe Hominini as including both Pan and Homo, placed in separate subtribes. The genus Pan is referred to subtribe Panina, and genus Homo is included in the subtribe Hominina (see above). However, there is an alternative convention which uses "hominin" to exclude members of Panina, i.e. either just for Homo or for both human and australopithecine species. This alternative convention is referenced in e.g. Coyne (2009) and in Dunbar (2014). Potts (2010) in addition uses the name Hominini in a different sense, as excluding Pan, and uses "hominins" for this, while a separate tribe (rather than subtribe) for chimpanzees is introduced, under the name Panini. In this recent convention, contra Gray, the term "hominin" is applied to Homo, Australopithecus, Ardipithecus, and others that arose after the split from the line that led to chimpanzees (see cladogram below); that is, they distinguish fossil members on the human side of the split, as "hominins", from those on the chimpanzee side, as "not hominins" (or "non-hominin hominids"). This cladogram shows the clade of superfamily Hominoidea and its descendent clades, focussed on the division of Hominini (omitting detail on clades not ancestral to Hominini). The family Hominidae ("hominids") comprises the tribes Ponginae (including orangutans), Gorillini (including gorillas) and Hominini, the latter two forming the subfamily of Homininae. Hominini is divided into Panina (chimpanzees) and Australopithecina (australopithecines). The Hominina (humans) are usually held to have emerged within the Australopithecina (which would roughly correspond to the alternative definition of Hominini according to the alternative definition which excludes Pan). Genetic analysis combined with fossil evidence indicates that hominoids diverged from the Old World monkeys about 25 million years ago (Mya), near the Oligocene-Miocene boundary. The most recent common ancestors (MRCA) of the subfamilies Homininae and Ponginae lived about 15 million years ago. In the following cladogram, the approximate time the clades radiated newer clades is indicated in millions of years ago (Mya). Model of the phylogeny of Hominini over the past 10 million years. Both Sahelanthropus and Orrorin existed during the estimated duration of the ancestral chimpanzee-human speciation events, within the range of eight to four million years ago (Mya). Very few fossil specimens have been found that can be considered directly ancestral to genus Pan. News of the first fossil chimpanzee, found in Kenya, was published in 2005. However, it is dated to very recent times—between 545 and 284 thousand years ago. The divergence of a "proto-human" or "pre-human" lineage separate from Pan appears to have been a process of complex speciation-hybridization rather than a clean split, taking place over the period of anywhere between 13 million years ago (close to the age of the Hominini tribe itself) and some 4 million years ago. Different chromosomes appear to have split at different times, with broad-scale hybridization activity occurring between the two emerging lineages as late as the period 6.3 to 5.4 Mya, according to Patterson et al. (2006), This research group noted that one hypothetical late hybridization period was based in particular on the similarity of X chromosomes in the proto-humans and stem chimpanzees, suggesting the final divergence even as recent as 4 Mya. Wakeley (2008) rejected these hypotheses; he suggested alternative explanations, including selection pressure on the X chromosome in the ancestral populations prior to the chimpanzee–human last common ancestor (CHLCA). Most DNA studies find that humans and Pan are 99% identical, but one study found only 94% commonality, with some of the difference occurring in noncoding DNA. It is most likely that the australopithecines, dating from 3 to 4.4 Mya, evolved into the earliest members of genus Homo. In the year 2000, the discovery of Orrorin tugenensis, dated as early as 6.2 Mya, briefly challenged critical elements of that hypothesis, as it suggested that Homo did not in fact derive from australopithecine ancestors. All the listed fossil genera are evaluated for: 1) probability of being ancestral to Homo, and 2) whether they are more closely related to Homo than to any other living primate—two traits that could identify them as hominins. Some, including Paranthropus, Ardipithecus, and Australopithecus, are broadly thought to be ancestral and closely related to Homo; others, especially earlier genera, including Sahelanthropus (and perhaps Orrorin), are supported by one community of scientists but doubted by another. ^ Fuss, J; Spassov, N; Begun, DR; Böhme, M (2017). "Potential hominin affinities of Graecopithecus from the Late Miocene of Europe". PLoS ONE. 12 (5). ^ a b Mann, Alan; Mark Weiss (1996). "Hominoid Phylogeny and Taxonomy: a consideration of the molecular and Fossil Evidence in an Historical Perspective". Molecular Phylogenetics and Evolution. 5 (1): 169–181. doi:10.1006/mpev.1996.0011. PMID 8673284. ^ Delson, Journal of Human Evolution 6 (1977), p. 450. ^ a b Potts (2010). “What Does It Mean to Be Human?”, pp. 34. ISBN 978-1-4262-0606-1. National Geographic Society, Washington. ^ a b "Conventionally, taxonomists now refer to the great ape family (including humans) as 'hominids', while all members of the lineage leading to modern humans that arose after the split with the [Homo-Pan] LCA are referred to as 'hominins'. The older literature used the terms hominoids and hominids respectively." Dunbar, Robin (2014). Human evolution. ISBN 9780141975313. ^ B. Wood (2010). "Reconstructing human evolution: Achievements, challenges, and opportunities". Proceedings of the National Academy of Sciences. 107: 8902–8909. Bibcode:2010PNAS..107.8902W. doi:10.1073/pnas.1001649107. PMC 3024019. PMID 20445105. ^ Bradley, B. J. (2006). "Reconstructing Phylogenies and Phenotypes: A Molecular View of Human Evolution". Journal of Anatomy. 212 (4): 337–353. doi:10.1111/j.1469-7580.2007.00840.x. PMC 2409108. PMID 18380860. ^ Wood and Richmond. ; Richmond, BG (2000). "Human evolution: taxonomy and paleobiology". Journal of Anatomy. 197 (Pt 1): 19–60. doi:10.1046/j.1469-7580.2000.19710019.x. PMC 1468107. PMID 10999270. Thus human evolution is the study of the lineage, or clade, comprising species more closely related to modern humans than to chimpanzees. Its stem species is the so-called ‘common hominin ancestor’, and its only extant member is Homo sapiens. This clade contains all the species more closely related to modern humans than to any other living primate. Until recently, these species were all subsumed into a family, Hominidae, but this group is now more usually recognised as a tribe, the Hominini. ^ "Fossils May Pinpoint Critical Split Between Apes and Monkeys". redOrbit.com. 15 May 2013. ^ The most well-known fossil genus of Ponginae is Sivapithecus, consisting of several species from 12.5 million to 8.5 million years ago. It differs from orangutans in dentition and postcranial morphology. > Taylor, C. (2011). "Old men of the woods". Palaeos. Retrieved 2013-04-04. ^ McBrearty, Sally; Nina G. Jablonski (2005). "First fossil chimpanzee". Nature. 437 (7055): 105–108. Bibcode:2005Natur.437..105M. doi:10.1038/nature04008. PMID 16136135. ^ Patterson N, Richter DJ, Gnerre S, Lander ES, Reich D (June 2006). "Genetic evidence for complex speciation of humans and chimpanzees". Nature. 441 (7097): 1103–8. Bibcode:2006Natur.441.1103P. doi:10.1038/nature04789. PMID 16710306. ^ Wakeley J (March 2008). "Complex speciation of humans and chimpanzees". Nature. 452 (7184): E3–4, discussion E4. Bibcode:2008Natur.452....3W. doi:10.1038/nature06805. PMID 18337768. "Patterson et al. 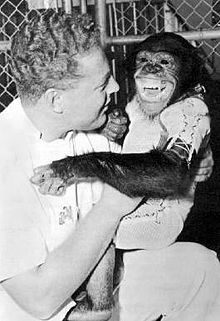 suggest that the apparently short divergence time between humans and chimpanzees on the X chromosome is explained by a massive interspecific hybridization event in the ancestry of these two species. However, Patterson et al. do not statistically test their own null model of simple speciation before concluding that speciation was complex, and—even if the null model could be rejected—they do not consider other explanations of a short divergence time on the X chromosome. These include natural selection on the X chromosome in the common ancestor of humans and chimpanzees, changes in the ratio of male-to-female mutation rates over time, and less extreme versions of divergence with gene flow. I therefore believe that their claim of hybridization is unwarranted." ^ Mary-Claire King (1973) Protein polymorphisms in chimpanzee and human evolution, Doctoral dissertation, University of California, Berkeley. ^ Wong, Kate (1 September 2014). "Tiny Genetic Differences between Humans and Other Primates Pervade the Genome". Scientific American. ^ Minkel JR (2006-12-19). "Humans and Chimps: Close But Not That Close". Scientific American. ^ Coyne, Jerry A. (2009) Why Evolution Is True, pp.202-204. ISBN 978-0-670-02053-9(hc), ISBN 978-0-14-311664-6(pbk). Penguin Books Ltd, London. "After A. afarensis, the fossil record shows a confusing melange of gracile australopithecine species lasting up to about two million years ago. … [T]he late australopithecines, already bipedal, were beginning to show changes in teeth, skull, and brain that presage modern humans. It is very likely that the lineage that gave rise to modern humans included at least one of these species." ^ Cameron, D. W. (2003). "Early hominin speciation at the Plio/Pleistocene transition". HOMO - Journal of Comparative Human Biology. 54 (1): 1–28. doi:10.1078/0018-442x-00057. PMID 12968420. ^ Potts, Richard and Sloan, Christopher. “What Does It Mean to Be Human?”, pp. 38-39. ISBN 978-1-4262-0606-1. National Geographic Society, Washington. ^ Reynolds, Sally C; Gallagher, Andrew (2012-03-29). African Genesis: Perspectives on Hominin Evolution. ISBN 9781107019959. :"The discovery of Orrorin has ... radically modified interpretations of human origins and the environmental context in which the African apes/hominoid transition occurred, although ... the less likely hypothesis of derivation of Homo from the australopithecines still holds primacy in the minds of most palaeoanthropologists." ^ Potts, Richard and Sloan, Christopher. “What Does It Mean to Be Human?”, pp. 31-42. ISBN 978-1-4262-0606-1. National Geographic Society, Washington. ^ Brunet, Michel; Guy, F; Pilbeam, D; MacKaye, H. T.; Likius, A; Ahounta, D; Beauvilain, A; Blondel, C; Bocherens, H; Boisserie, JR; De Bonis, L; Coppens, Y; Dejax, J; Denys, C; Duringer, P; Eisenmann, V; Fanone, G; Fronty, P; Geraads, D; Lehmann, T; Lihoreau, F; Louchart, A; Mahamat, A; Merceron, G; Mouchelin, G; Otero, O; Pelaez Campomanes, P; Ponce De Leon, M; Rage, J. C.; et al. (July 2002), "A new hominid from the Upper Miocene of Chad, Central Africa", Nature, 418 (6894): 145–151, doi:10.1038/nature00879, PMID 12110880, Sahelanthropus is the oldest and most primitive known member of the hominid clade, close to the divergence of hominids and chimpanzees. ^ Wolpoff, Milford; Senut, Brigitte; Pickford, Martin; Hawks, John (October 2002), "Sahelanthropus or 'Sahelpithecus'?" (PDF), Nature, 419 (6907): 581–582, Bibcode:2002Natur.419..581W, doi:10.1038/419581a, PMID 12374970, Sahelanthropus tchadensis is an enigmatic new Miocene species, whose characteristics are a mix of those of apes and Homo erectus and which has been proclaimed by Brunet et al. to be the earliest hominid. However, we believe that features of the dentition, face and cranial base that are said to define unique links between this Toumaï specimen and the hominid clade are either not diagnostic or are consequences of biomechanical adaptations. To represent a valid clade, hominids must share unique defining features, and Sahelanthropus does not appear to have been an obligate biped. Yohannes Haile-Selassie, Stephanie M. Melillo, and Denise F. Su, "The Pliocene hominin diversity conundrum: Do more fossils mean less clarity?" PNAS June 7, 2016 vol. 113 no. 23, 6364-6371, doi: 10.1073/pnas.1521266113. Human Timeline (Interactive) – Smithsonian, National Museum of Natural History (August 2016).